A cold front will bring spotty rain and a chance of storms today. Meteorologist Kari Hall has the details in the Microclimate Forecast. A taste of spring will return to the Bay Area just in time for the weekend. The National Weather Service on Thursday said that Sunday afternoon highs could reach the mid to upper 70s in some spots across the region. The temperature in San Jose is expected to soar to a balmy 77 degrees Sunday afternoon, according to the weather service. Santa Rosa is slated to reach 76 degrees. Concord is expected to peak at 75 degrees. Napa, Livermore and Fairfield are all predicted to check in at 73 degrees. Some spots along the coast, including San Francisco and Half Moon Bay, aren't expected to break the 70-degree mark Sunday, but Santa Cruz is slated to top out at 74 degrees. 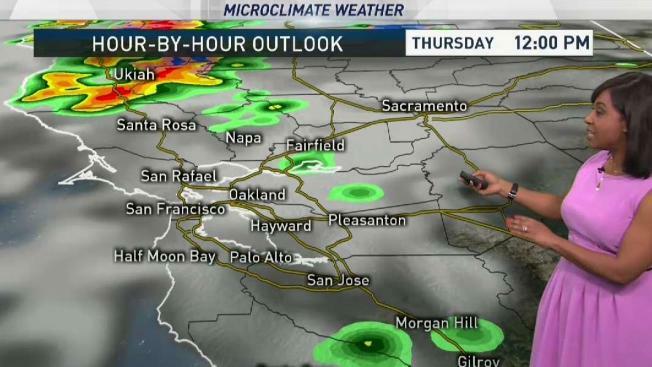 Bay Area residents will have to deal with some scattered showers Thursday before the dry and warmer weather starts to set in Friday. Enjoy the spring-like weather while it lasts. Rain is slated to return to the forecast next week, according to the weather service.